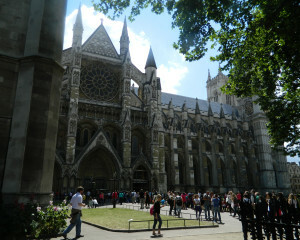 The first time I visited London, England was during a European tour with my grandparents when I was just 16 years old. 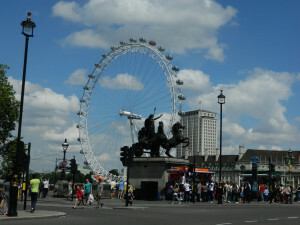 And London was the start and finish points of that 3-week “visit everywhere” tour. As a teen, the city felt huge and chaotic and fun but also a little scary. During my first trip back last month, it was still chaotic and fun – but also a lot more navigational as an adult! I had had a quick drive-by glance at these 3 stately buildings on my earlier visit as a youngster. But it was wonderful this time to get out and walk around and really look them over. One quick note: be sure to order tickets online if you’d like to go inside Westminster Abbey. This is the one thing I wanted to do but couldn’t because a long line stretched all the way to the side street. 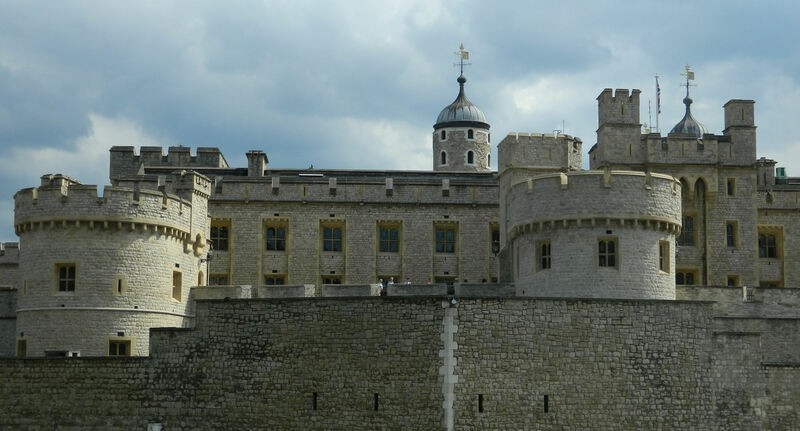 It was also wonderful to again see the Tower of London, which was originally built by William the Conqueror in 1078. I toured its many inside areas during my earlier trip and loved it. 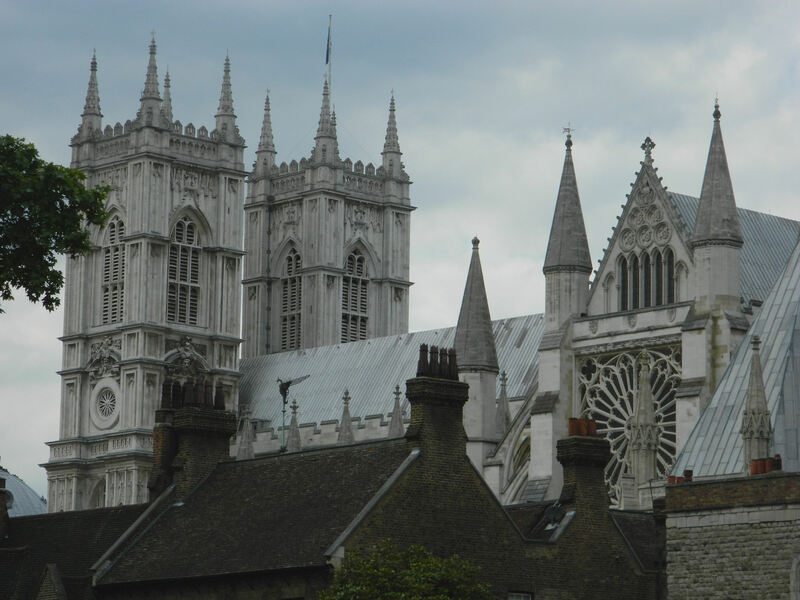 The Yeoman Warders or “Beefeaters” (tower guards), the monarchs’ suits of armor, and especially the Crown Jewels, showing majestic crowns, scepters, and rings, made quite an impression. Do NOT skip seeing this on your own trip! 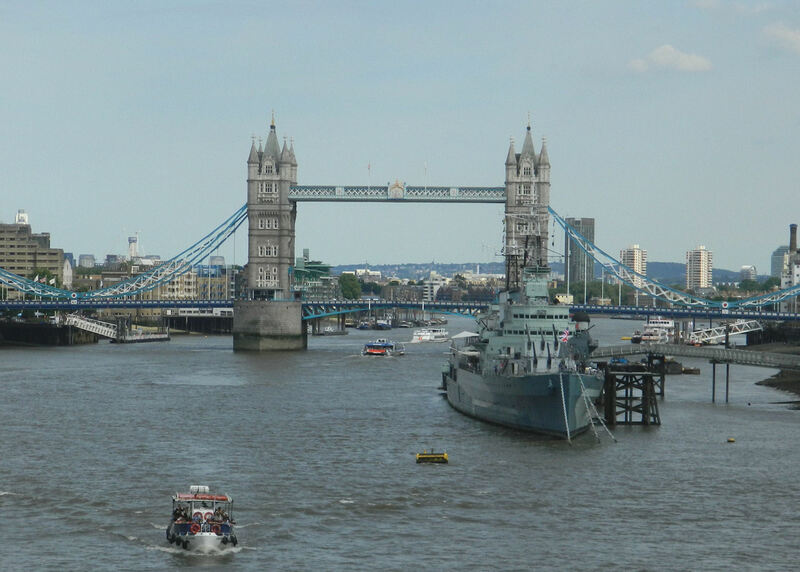 Twelve different bridges cross over the River Thames, but the most popular is the multicolor Tower Bridge. 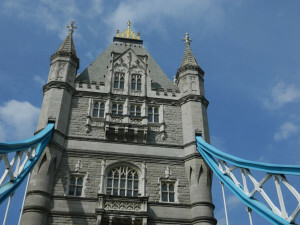 There are actual towers on either end, with the North West Tower housing a fascinating exhibit on the bridge’s history. 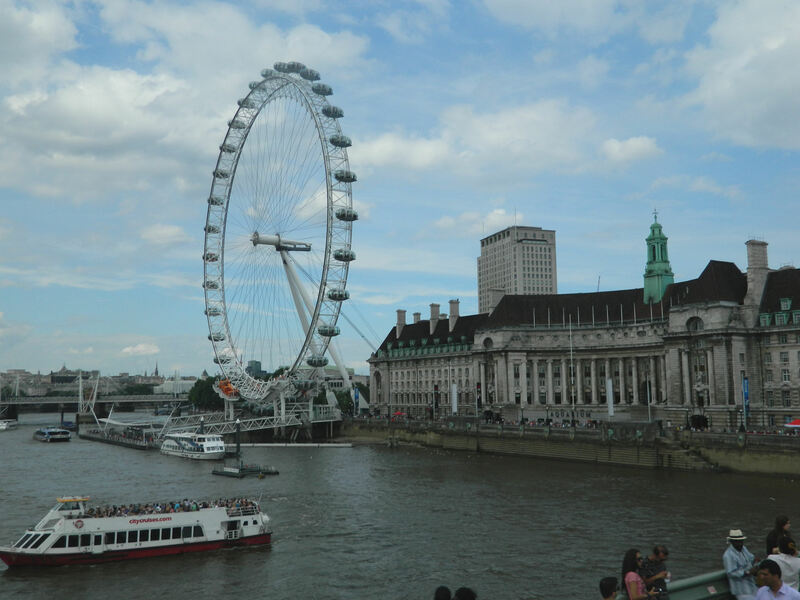 For a really different view of the city, don’t forget to grab a ride on the iconic London Eye — a giant Ferris Wheel that soars over the cityscape. Each egg-shaped car’s glass enclosures offer stunning views as the ride makes one complete rotation. By the way, I ordered my tickets beforehand but still had to wait in a huge line at the entry point. Learn from my mistake and make sure you also order “front of line” passes. It’ll easily save you an hour or more of waiting time. Yep, I’m not ashamed to admit to being a HUGE Harry Potter fan. And it’s no secret that author J.K. Rowling took inspiration from locales all around London. There are several walking tours that showcase locations from the Harry Potter books and films. 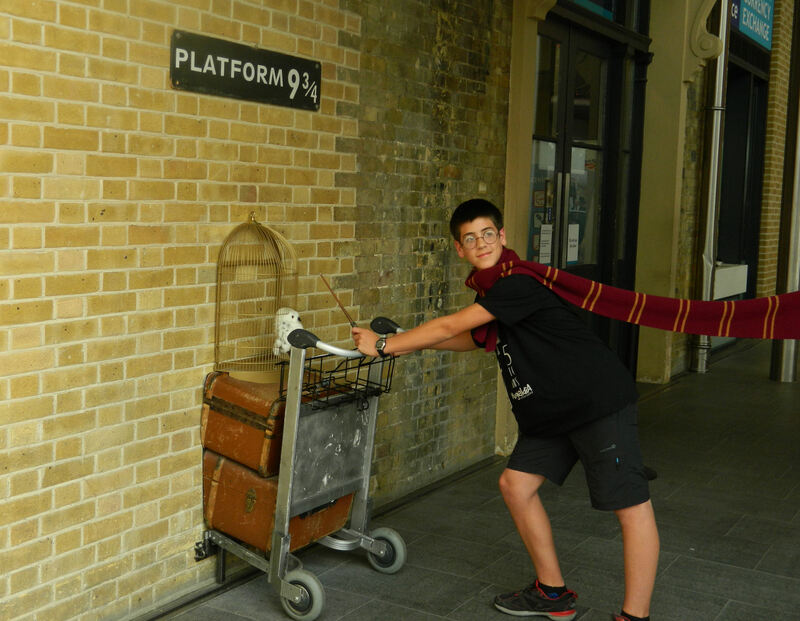 But because I was short on time, I took out by myself one evening in search of what has always been my favorite spot in the books – Platform 9 3/4. This is the magical portal that allows Hogwarts students to run straight through the wall and into the wizarding area where the Hogwarts Express awaits to take them to school. 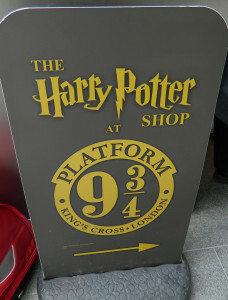 News reports say that Rowling’s parents actually met at the King’s Cross train station, so the location has always held an important place in her heart. Once I got to King’s Cross, I asked various workers along the way for directions to Platform 9 3/4. Each one broke into a huge smile and pointed me towards the famous spot. Wow, people still really love Mr. Potter! The station folks were very smart and have placed a luggage cart half in and half out of the wall under a sign for the platform. However, if you want your picture with the cart, it will cost you. Still, if you’re up for standing in the long line, the people collecting the money really do make it worthwhile. They hand over glasses and a wand and will wrap you in a Hogwarts scarf that they then hold up as if it’s caught by the wind! When I wrote about a recent trip to Edinburgh, Scotland, I admitted to not loving the food there. 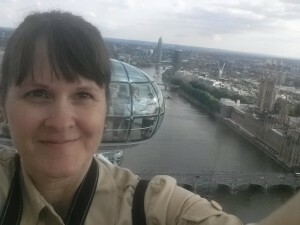 So, I was a little apprehensive about what I would find in London. But I needn’t have worried! I’m a huge seafood fan and there were all types of wonderfully tasty, fresh fish dishes everywhere I went – including this Peterhead cod over a wild garlic and broccoli puree with crispy polenta rolls (like fried grits!) in a tangy caper sauce. YUM!! Traffic is another problem, with cars and taxi cabs usually slowed to little more than a crawl. But I quickly fell in love with the Tube, London’s very efficient underground transport system. 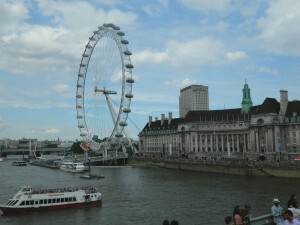 In fact, most evenings I would jump on the Tube just to try a far-flung restaurant or check out a specific attraction. The various routes are laid out really well and the price for an all-day or all-week pass isn’t bad at all. I know I certainly got my money’s worth crisscrossing all over the city! Overall, I really enjoyed seeing London again as an adult. It’s such a vibrant and colorful locale with tons of different options to see and do. In fact, I have a pretty big list of things to check out the next time I’m there. Hopefully it won’t take me so many years to go back! Thanks for sharing memories of an awesome trip!!!! Loved seeing the photos and hearing about your experiences. Thanks for the kind words Cheryl! It was a lot of fun. Love reading about your travel experiences. Your pictures are awesome. Good job Deborah. Thanks Darlene! 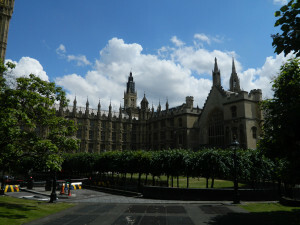 I was lucky that London had such great weather and no rain at all. That certainly helped the pictures! I think you are very brave to travel like you do. Do you always travel alone if your mother is not with you? Good for you. I love the Harry Potter picture op. What a wonderful story on London. I have never been there but after reading this story and seeing the beautiful pictures it is certainly on my list of must see places in the world. Thank you for sharing it. You’re welcome! It really was a lot of fun! 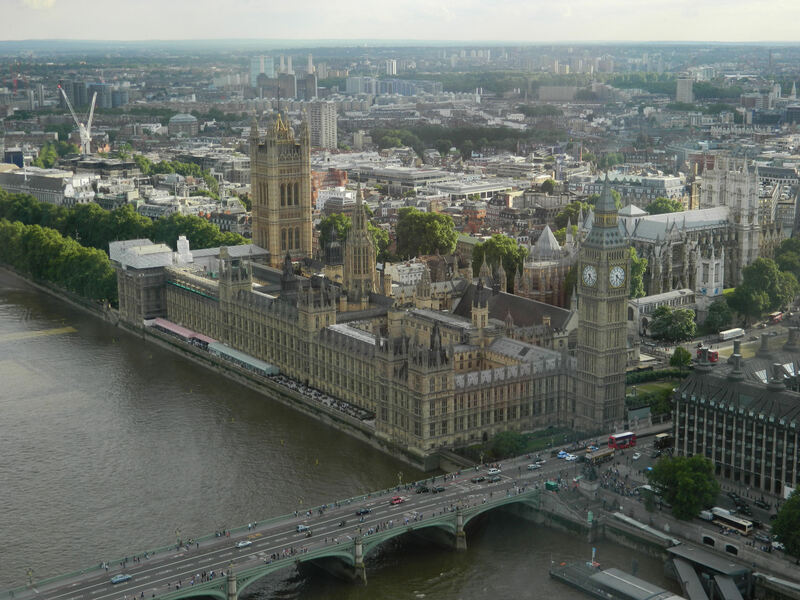 So much of the world to see and so little time…(apologies to Sir Winston Churchill), therefore, I rely on your travel blog to fill in the blanks for me. My stop overs at Heathrow have, obviously, not scratched the surface of the wonders of London. Thanks for another wonderful, encouraging description of the things to do, see and eat in places I hope to visit someday. Awww, thanks for the nice words Sandy! I am determined to get to London and other parts of Europe some day before my kids head out on their own. It looks amazing. The architecture is just beautiful, and Platform 9 3/4? Love it! I love that they even simulate the wind in the scarf. lol It’s the little things, the details. Thanks so much for sharing at Inspire Me Wednesday. Featuring you in this week’s issue. Lovely photos. You did such a good job. I’ve always thought England would be fun to visit! Thanks for stopping by and for the compliments! I think you’d have a LOT of fun in London. Soooo much to do! 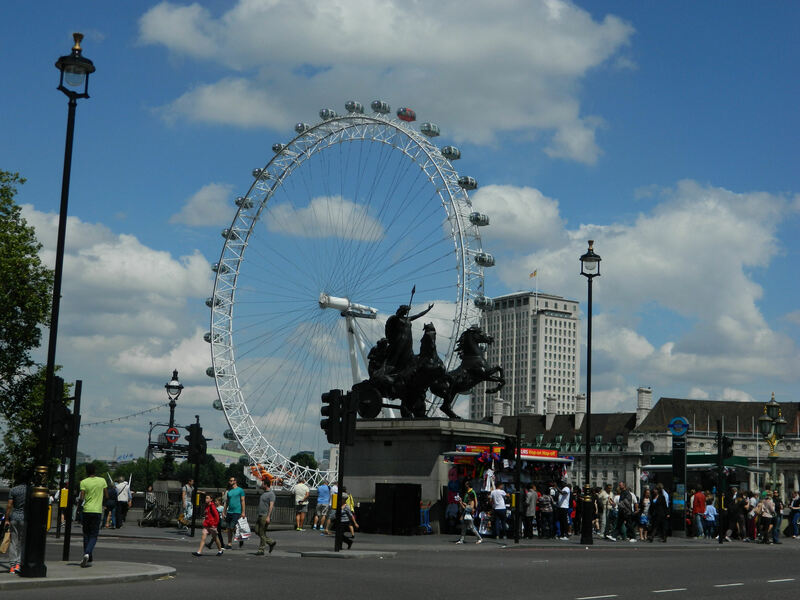 I am dying to go to London! Great memories!! I hope you get to go there soon Audra! It really is a great place to explore. Whoa! 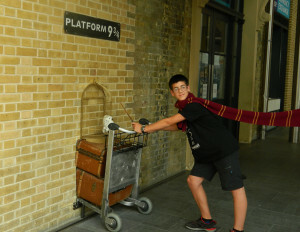 No one was charging for photos when I had my photo taken at Platform 9 3/4 two years ago. No vintage suitcases on the cart either. Must be something new. Also, the Tower of London is definitely one of my favorite suggestions. So worth the money and you can spend all day soaking it in! You’re right Sarah, the Tower is sooo cool! Interesting about Platform 9 3/4. As mentioned in the comments above, it sounds like you can go “after hours” and not pay – but then you don’t get the cool props. Not sure what I’ll do next time I go except that I WILL get my pic taken there one way or another! Glad you stopped by from ARWB! The overall city and the old buildings looked the same as when I was there at the age of 16, but it didn’t seem quite so scary now that I’m, um, a little older. Really interesting city. I’ll cross my fingers for you that a visit is on the travel menu soon! And thanks for stopping by from #sitsblogging ! About 14 years ago, I too was on a “visit-everywhere” European tour. We flew in and out of London, and had a few days to explore the city on either end…but it wasn’t long enough, and I vowed I would be back. Thank you for reminding me of all the spectacular sights London has to offer. The only thing I would have to disagree with is the food – we found the food to be pretty terrible…but maybe things have changed in the last 14 years!? Happy travels! PS. Found you via SITS Sharefest. I’m not saying there weren’t a few, um “challenging” options on the menus Kim! But as a huge seafood lover, I was plenty happy ordering fish for almost every meal — and it was always good. You definitely need to give it another try all these years later! 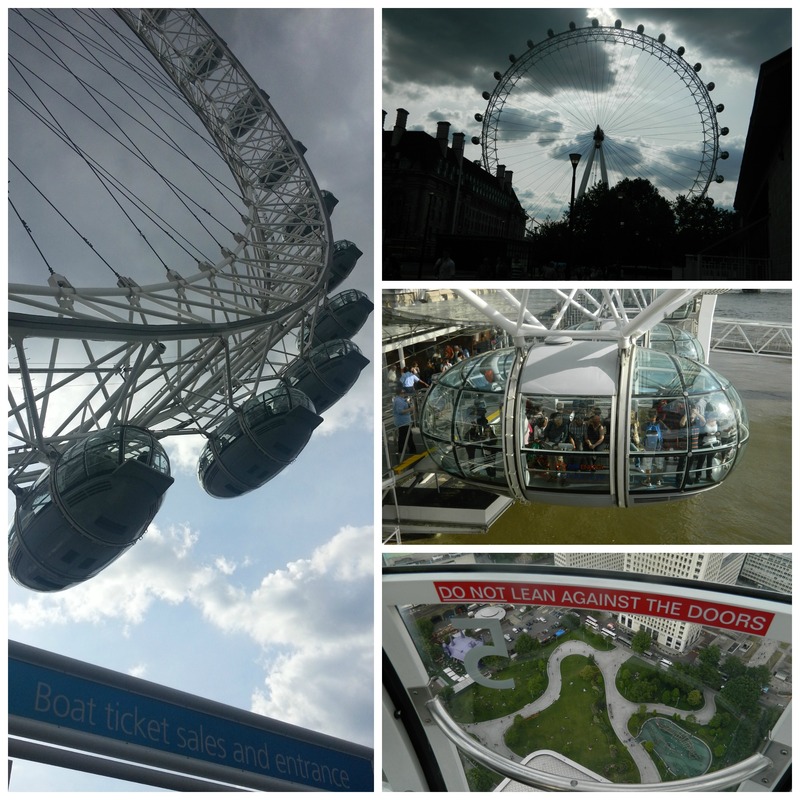 London was fun…we enjoyed our visit there as well. Your photos bring back some great memories…thanks for sharing! Thanks for stopping by Jodee! It was actually more fun than I even expected. And of course I have a HUGE list of things to do next time! I’m going to be in London in a few weeks, and your post has me super excited! Any restaurant recommendations?? Oooh, lucky you! Come back and leave a link to your post-trip write up. I REALLY liked the Jugged Hare and the Chiswell Street Dining Rooms, both of which are very close to the Barbican (conference) Center. 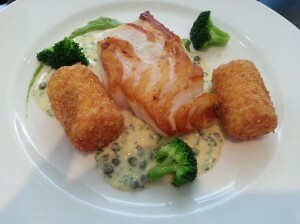 In fact, Chiswell Street Dining is where I took the picture of that gorgeous plate of food above! Two quick tips, though: if you order fish and don’t want it served with skin and head still on, ask for it to be taken off while ordering. Also, restaurants will often ask if you want “still” water. I thought this just meant regular water, said yes, and was then charged! So check on this with the restaurant you select. What a fun trip! 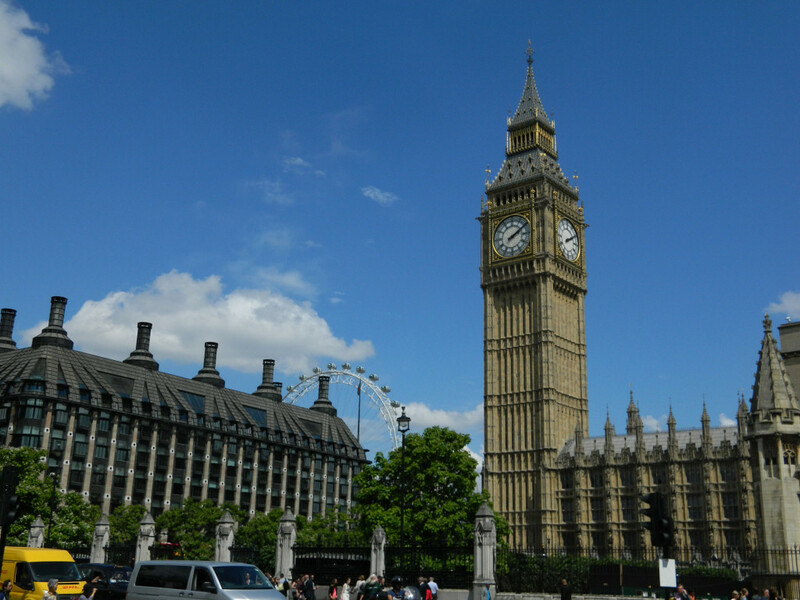 My hubby and I dream to travel to the UK and London someday! I’ll be pinning this post for the day that becomes reality! I’ll cross my fingers for you that a trip there comes up very soon! Thanks for stopping by. Great post! 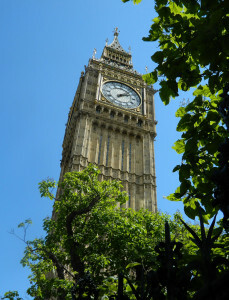 I love visiting London and your post makes me want to visit again. It is such a fun town! Thanks for the compliment! I too want to visit again. Soon!! I can’t believe they charge for photos at the 9 3/4 cart now! I visited London back in 2005 and you could go and snap a photo for completely free… I’m glad I had the chance to do so when I did since any way to save your pennies while in London is a good thing! You’re right – London is so expensive that it’s always good to save pennies whenever possible! As mentioned in the comments above, it sounds like you can go “after hours” and not pay – but then you don’t get the cool props. 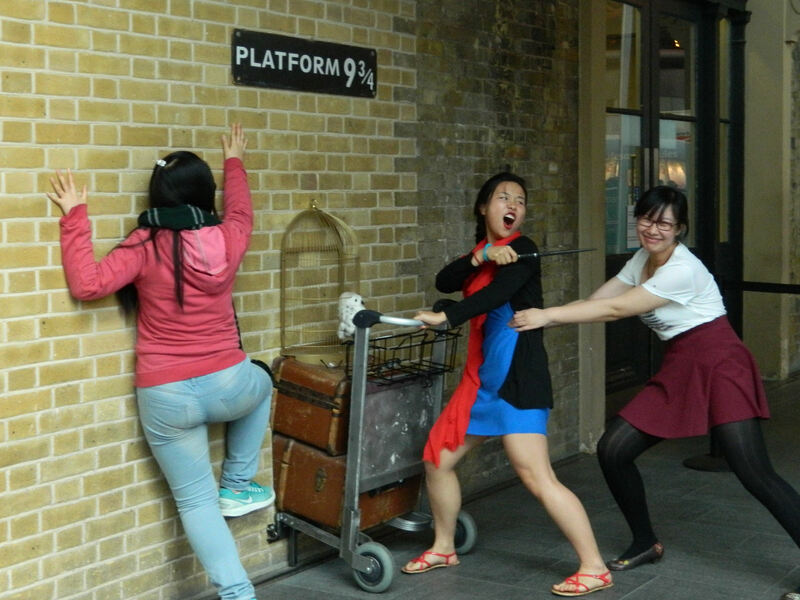 Sooo, I might have to actually break down and pay next time I go just so I can pose with the extra suitcases, the glasses, and the flowing scarf.